You now have a once-in-a-lifetime chance to move into a brand new world-class condo in the most exciting neighborhood in Austin, Texas. 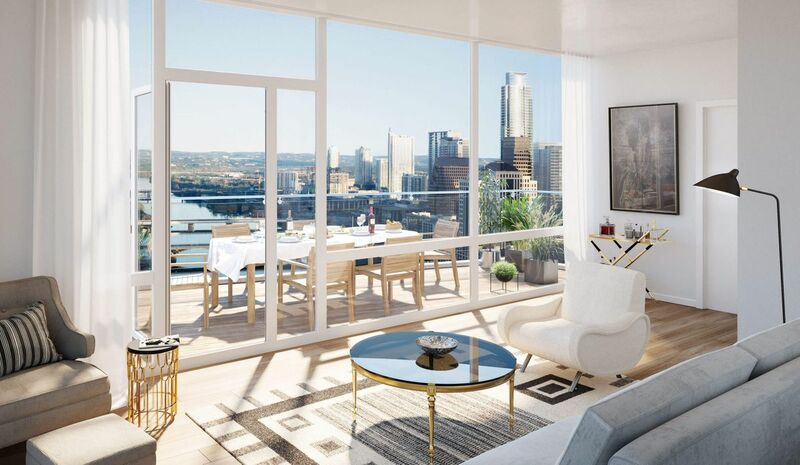 Downtown Austin’s newest hi-rise, 70 Rainey, currently under construction, will redefine what Austin luxury is all about. All of the condos at 70 Rainey are breathtaking, but for those who want the absolute best of the best, the tower's luxury penthouses take condo living to a whole new level. Model PH1 contains three bedrooms, three baths, a den, a spacious living room and dining area, a 26-foot-long balcony, a utility room, a wine or storage area, and generous closet space. With 2,978 square feet and high ceilings, you will enjoy the feeling of spaciousness. Light from three sides suffuses the residence. The penthouse design is bright and modern, and the views from the terrace and windows are breathtaking. Markzeff custom designed kitchens make cooking delightful, whether you are entertaining friends or spending a quiet evening with your family. PH3 spans three stories and contains two balconies and a terrace, making it the ideal choice if you love views and fresh air. This spacious floor plan contains a den with its own powder room and rooftop terrace on a separate floor along with spacious areas for entertaining. With three separate living areas, this condominium is the perfect space to entertain large groups. On the third level of this home, you can use the den as a spare bedroom, another living area, or even a home office with sweeping views of downtown and the water. The largest luxury penthouse at 70 Rainey is model PH7. This exquisite residence encompasses two stories of living space and has many unique amenities. It contains three bedrooms, two dens, a study, both a balcony and a large terrace, and views that you have to see to believe. Light pours through this luxury condominium, and its many rooms offer areas for residents and visitors to gather or to seek their own space. The den with its own powder room downstairs offers a retreat when you need one, while the upstairs area containing the living room, dining room, and open kitchen provide a perfect space to mingle. The enormous closets offer ample room for your treasured possessions. No detail has been overlooked in the premium luxury finishes that make this floor plan the home you've always dreamed of. You can now take a hard-hat tour of 70 Rainey and get a preview of these exciting Austin condos. Call us at (512) 476-7010, or email us at info@70Rainey.com and we would be glad to answer your questions and show you around. Don't miss the chance to make one of these extraordinary penthouses your own.